From cover's back: "Evil Magica De Spell has stolen the Lucky Dimes and has captured Huey, Dewey and Louie! 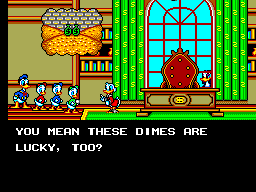 Trek through six treacherous lands with Donald to save his nephews and retrieve the Lucky Dimes!" I was surprised to discover that Lucky Dime was not released in the US, as this game here (Italy) is pretty much one of the SMS' symbols. Sure, experts know about Phantasy Star and other Sega classics, but the average guy will immediately link "SMS" to "Donald". Donald's quest is pretty straightforward: there are no options of sort at the beginning, you just have to complete all the seven stages. You can, however, select in which order to play the first three and later the three remaining before the last stage (Magica's castle). 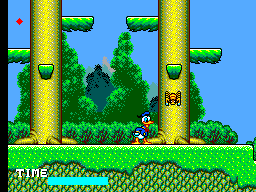 Donald can jump on enemies, luckily without having to press another button to harm them; moreover, he starts equipped with a powerful hammer, that is one of the two weapons in the game. The other is a nice Frisbee that you can even throw upside. Having a weapon is your only kind of "health" in the game: be hit once and you'll say goodbye to your weapon, be hit once more and you die. Quite a simple and idea to add some challenge to the game; it was removed from the Game Gear version. Donald will collect some stars released by enemies or scattered through levels: each star will make your weapon swing faster, up to four: collect a fifth one and you'll be invincible for a (very) limited time. So yes, they are pretty useless, just keep one or two to have a decent fire rate. You start with three lives, but you can get more at random by beating enemies, and quite often. Anyway, you are granted with unlimited continues, so you'll eventually complete the game. It's not hard, but it can be refreshingly trickier than your usual Disney game. In the later stages, being equipped with the right weapon surely does a difference, which is nice. Finally, you have a time limit to complete each stage, or you'll lose a life. I wouldn't worry too much about it, though. I love the graphics in this game. The main sprite really captures Donald's spirit. I mean, I love the "Indiana Jones wannabe" Donald in Quackshot on Megadrive, but here you have the character in its classic sailor outfit. Awesome. The weapons Sega chose also fit him very much. The stages share a common feeling within these games: you have a forest, mountain path, Andes, tropical Islands (with an active volcano), the pyramids, the south pole and the final haunted castle. In other words it's all very cliché: "fire", "ice", "temple" and even the mandatory "swim" section. But no matter how many platforms before used these locations, here all of them are brilliant, giving you almost a "classic" feeling. Finally, the enemies are quite varied and detailed too. Among bosses, the bear and the lion are the nicest battles. I also like a lot Magica De Spell, one of the best villains in the Duck clan's history. The game does have some catchy tunes. You'll love especially the first stage theme, very hummable. The score is nothing outstanding, but nicely done and appropriate for the game. You won't be annoyed by it, so it's not one of those games that require to mute the TV set and turn on the radio instead. Donald controls smoothly: jump control is very accurate, as well as collision detection. The game has a fast pace: gone is the "crate lifting" action as in Mickey's games, so you'll blaze through the stages quicker. There is a bit of enemy respawning (you can take advantage of this to gather lots of extra lives), but it's tolerable. At some tricky points often you'd wish they didn't come with the remove weapon system: it can be annoying to lose it, and even worse to have it replaced with the other one by mistake. Without alternate paths and without many secret areas, once finished you'll pick this one up again just for nostalgia. The stage select thing doesn't help either to keep it fresh. Still, you don't need to be a skilled player to complete this game in an afternoon, so it's always a pleasure to have a short session of platform goodness. This is your typical Sega/Disney platform, done at its best. I personally think that no other developer managed to do such a good use of Disney characters, not Capcom, nor Disney Interactive or others. I sense this game doesn't get the attention it deserves, and is quite overshadowed by Mickey, and that's a shame, 'cause Donald rocks much more than the mouse. 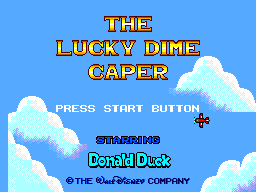 Lucky Dime Caper is definitely one of the best of its genre on the Master System, and the best Donald game along with Quackshot. Play it!